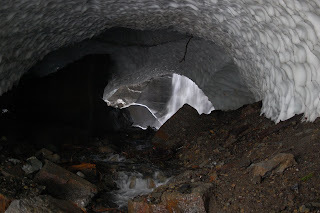 Although a rainy day prevented serious hiking, we did get out to explore the ice caves at the foot of Big Four mountain. The caves were spectacular! They are quite unlike ice formations in glaciers. The caves had been inaccessible for three years due to a washed out footbridge crossing the Stillaguamish river. The new bridge is shiny, well-built, and much appreciated!